An F/A-18E Super Hornet launches from the U.S. Navy aircraft carrier USS Harry S. Truman in support of Exercise Trident Juncture 18 in the Norwegian Sea, Oct. 25, 2018. U.S. Navy/Mass Communication Specialist 3rd Class Adelola Tinubu/Handout via Reuters. NATO's secretary-general said Tuesday he is confident that both the Western military alliance and Russia “will act in a respectable way” as the two sides hold drills in the same area in waters off Norway's coast. The Russian missile tests will take place November 1-3 off western Norway. The NATO drill, scheduled to end November 7, takes place in central and eastern Norway, the North Atlantic and the Baltic Sea. The maneuvers come amid persistent tensions between NATO and Russia, and Moscow believes the alliance is behaving provocatively near its borders. “This is a necessary exercise” to “send a strong signal of unity,” Stoltenberg told reporters as he visited the NATO maneuvers that involve around 50,000 personnel from all 29 NATO allies, plus partners Finland and Sweden. 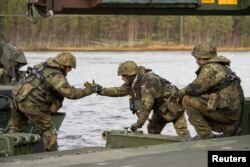 German soldiers from 2 Company Multinational Engineer Battalion of NATO’s Very High Readiness Joint Task Force, man an M3 Amphibious Rig while conducting river crossing training during Exercise Trident Juncture 2018 at Camp Roedsmoen in Rena, Norway, Oct. 25, 2018. Sgt Marc-Andre Gaudreault/NATO JFC Brunssum Imagery/Handout via Reuters. The U.S. Navy admiral commanding the war games said Russia has been monitoring the drill with “curiosity,” judging from recent regional movements of Russian troops in the air and at sea. He did not elaborate. “I have no issue with that as long as it doesn't interfere with what we do,” Adm. James Foggo told reporters in Finland on Friday, adding that he expected Moscow to take a “professional” stance to the drill and dispatch military observers. “No-one should have an issue of us (NATO) operating on international waters or international airspace,” Foggo said. He called Finland and Sweden “very, very capable” NATO partner countries, and said the drills offer a chance for the alliance and the two Nordic nations to test their cooperation. The countries have been alarmed by neighboring Russia's substantially increased military maneuvers in the region during the past few years. Hundreds of Finnish and Swedish air, infantry and naval troops will be involved with Trident Juncture, prompting Russia's Foreign Ministry on Thursday to remind the two countries that NATO's drill “fits within the policy of the United States toward making Europe less secure”. Adm. Foggo said it was the first time since the end of the Cold War that a U.S. aircraft carrier is sailing so far north above the Arctic Circle. In conjunction with Trident Juncture, the USS Harry S. Truman, a massive aircraft carrier, was leading a U.S. strike carrier group conducting air, surface and underwater exercises in the rough Arctic seas, he said.